A neighborhood justifiably lauded as one of the nation's finest examples of a residence park. 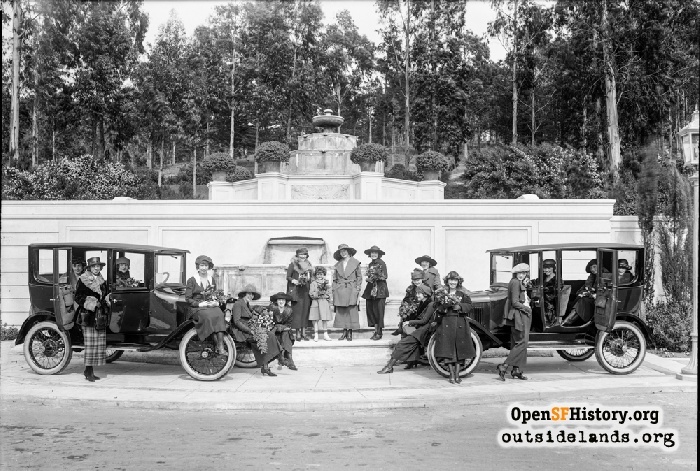 Location: Portola Drive and Sloat Boulevard on the north and west, Monterey Boulevard on the south, San Anselmo/Santa Paula/San Pablo Avenues on the east. St. Francis Wood is justifiably lauded as one of the nation's finest examples of a "residence park." After the resolution of Adolph Sutro's will in the early 1910s, the Residential Development Company bought from his estate 725 acres of the old Mexican land grant, the Rancho San Miguel. 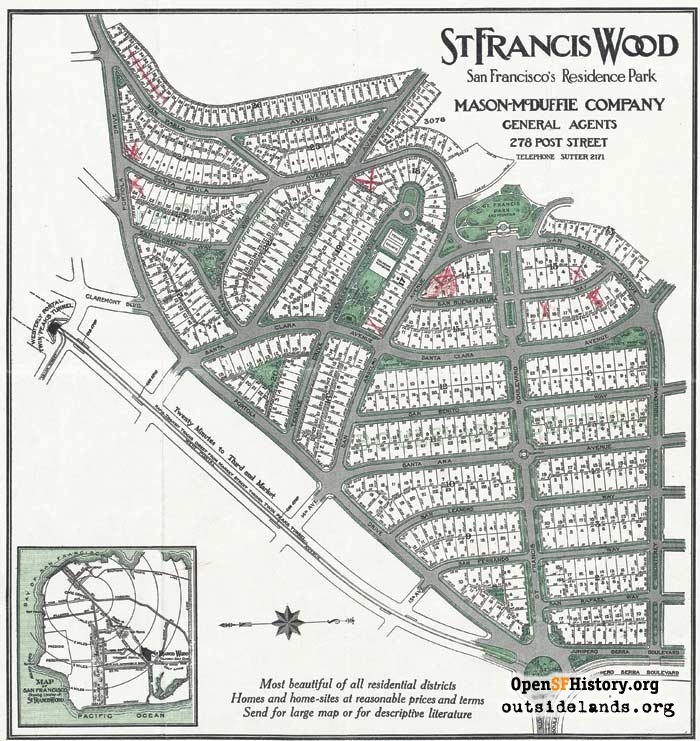 Shortly thereafter, the Mason-McDuffie Company purchased 175 acres of the land to create St. Francis Wood. The "City Beautiful" movement, popularized by heralded landscape architect and planner Daniel Burnham, influenced the community plan, and restrictions of every kind shaped the development that arose. Mason-McDuffie banned businesses in the tract (only single-family homes), buried utilities beneath the sidewalks, and laid out wide streets. Restrictions set for houses included a two-story height limit, a minimum twenty-foot setback from the street and free space on either side to be no less than a total 25% of the lot width. House cost had to be over $3,500 initially and plans needed to be approved by the supervising architect employed by the St. Francis Homes Association. As with other residence parks and exclusive communities of the time, minority ownership and residency was also banned. It wasn't until the 1960s that St. Francis Wood became integrated. Landscape features meant to be "reminiscent of the loveliest gardens of the Italian Renaissance" ornamented the grounds, including an elaborate gateway and two fountains on the main arterial, St. Francis Boulevard. The famed landscape firm Olmsted Brothers laid out the curvilinear street plan. John Galen Howard acted as the first supervising architect, designing the elaborate lamposts, brick-diamond sidewalks, entryway pillars, and the main gate and first fountain. Henry Gutterson soon succeeded Howard, and designed the monumental upper fountain and numerous houses over the next three decades. Prominent names in local architecture are attached many of the early houses, including Willis Polk, Martin Rist, Timothy Pflueger, Bernard Maybeck, and Julia Morgan. The St. Francis Homes Association is still very active and responsible for maintaining and enhancing the lavish landscaping and tract amenities. For decades, two other community organizations, the Garden Club of St. Francis Wood and the St. Francis Wood Women's League, have also provided social functions and raised money to maintain San Francisco's "garden suburb." 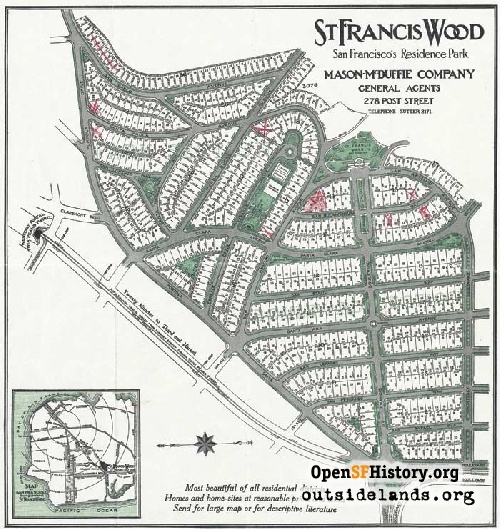 Contribute your own stories about St. Francis Wood!